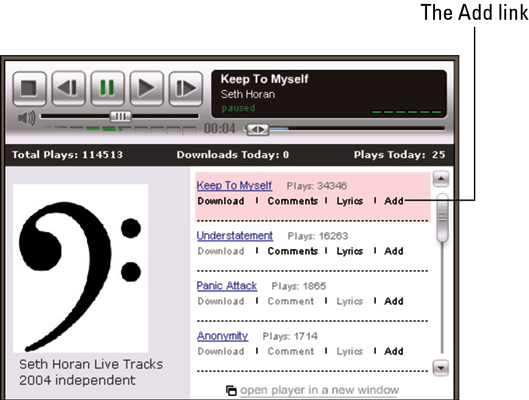 Click the Add link next to that song on the site’s jukebox. You do have to be logged in to your MySpace account at this point to add or change your song. Confirm your entry by selecting the My Profile Playlist in the top dropdown menu and click OK. The song is added to your profile page just like that — and it plays every time someone views your page. The song appears as a small player (as shown in this figure), just below your profile picture and Contact box. The one button on the player allows you to pause or continue playback of the song. Have fun! And you’re not stuck with the song forever, either. If you run across another song you want to put on your profile, click the Add link next to it. You can only have one song linked to your profile, but you can change it as many times as you want. The Internet is changing all the time (but you knew that). MySpace is no exception. So, check the song occasionally to make sure the link is still active. When a band removes a song from their page, your link dies — and you’re left with an empty player. When that happens, it’s time to go looking for some new tunes.